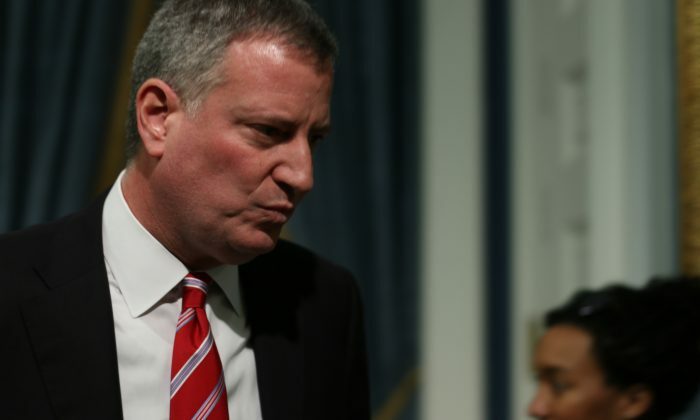 NEW YORK—The web page set up by Mayor Bill de Blasio’s office to track freedom of information document requests pales in comparison to the government transparency standards currently in place at the federal level. The mayor’s office introduced its Freedom of Information Law (FOIL) request tracker website on June 9. That website merely displays the dates on which requests were received and decided upon and the status for each request. The lack of transparency on the mayor’s FOIL website is quickly apparent in comparison to the freedom of information website used by the federal government. The federal website displays the name of each requester and the full description of each request. In addition, the documents sent in response to each request are available for the public to download. The freedom of information laws at federal and state levels say that all government documents, with few exceptions, are the property of the public and must be made available upon request. Freedom of Information requests are used by the media and government watchdogs as a key tool to ensure that the workings of the government are transparent to the public which funds it. As public advocate, de Blasio criticized the city’s FOIL process and called for sweeping changes. In particular, de Blasio’s report on the city’s FOIL process stated that “New York City should follow the federal government’s lead and transition to a single online portal for processing FOIL requests to city agencies.” The mayor may have forgotten the findings of that report on July 2, when in response to a question from Epoch Times he said that he does not “know the specific definition on the federal level,” and is not familiar with a City Council bill which would achieve what his own report had once called for. The federal laws on freedom of information are broader and more rigorous than what currently exists in New York state. As a result, agencies are compelled to report on their performance in fulfilling freedom of information requests. Members of the public can also access fully transparent logs of the requests as well as the documents procured through each. Compared to the federal freedom of information website, the mayor’s FOIL tracker is still in the dark ages. Curiously, the mayor’s administration pushed back against the proposed City Council bill that would mandate the creation of an open FOIL website similar to what currently exists at the federal level. In addition to improving transparency, such a website could slash redundant paperwork and reduce the amount the city spends to fulfill FOIL requests by as much as $13 million, according to a report by Reinvent Albany, a group promoting an open and accountable government. Maya Wiley, who testified about the Open FOIL bill on behalf of the mayor’s office on June 9, opposed the legislation in its current form, saying that providing the details of each request to the public may threaten the competitive advantage of the news media and should therefore be concealed. In response to an Epoch Times inquiry, the Committee on Open Government said that it will work on issuing an official advisory on the matter in the coming months and has forwarded the details to the mayor’s office for comments. The federal government has passed successive laws since the late 1990s aggressively expanding the reach of the freedom of information laws. Meanwhile, New York City’s “FOIL process is an expensive, bureaucratic mess,” Kaehny said in his testimony before the City Council.